Garnered with a 93 rating, CAO La Traviata is a full-bodied, full-flavored hand-rolled premium cigar offered in Natural and Maduro flavors. Individually crafted by hand from expert cigar rollers, both styles are infused with Nicaraguan and Dominican fillers, and Cameroon binders. Natural is wrapped in an Ecuadoran Havana tobacco leaf, the Maduro is available in a Connecticut Broadleaf wrapper. Premium cigar enthusiast will love these gems for their offering of a complex smoke with earthy tobacco flavors. 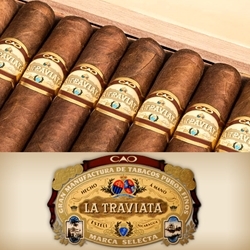 CAO La Traviata has been twice named to the “Top 25 Premium Cigars of the Year” by Cigar Aficionado. CAO La Traviata are handmade premium cigars that make an excellent choice for any cigar connoisseur. Smokers Discounts has made it easy and affordable to buy premium cigars online. A variety of sizes and flavors are listed below at our discount online cigar store. Each of these styles are in stock and available. Call us for more details!